It has been quite some time since I last saw a couple of friends, so we have been overdue for a catch up. As one of them will be moving back to Tokyo soon, there was no longer any time to waste. 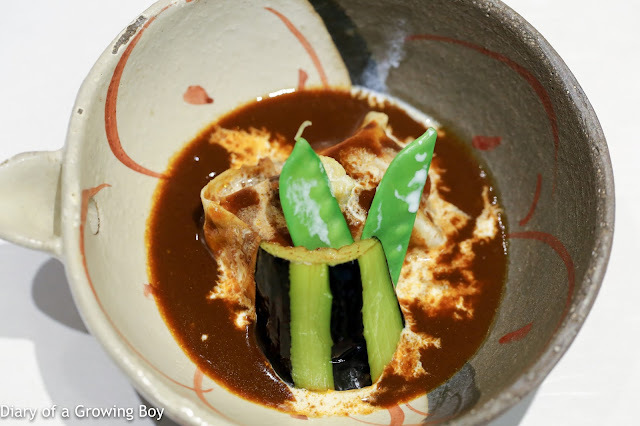 When it was suggested that we meet up for lunch at Tenkai (天海), I didn't hesitate to say "yes". The restaurant isn't usually open for lunch on Sundays, but we had pre-booked their omakase (お任せ) course and were able to enjoy a leisurely lunch - while people trying to walk-in were politely turned away. 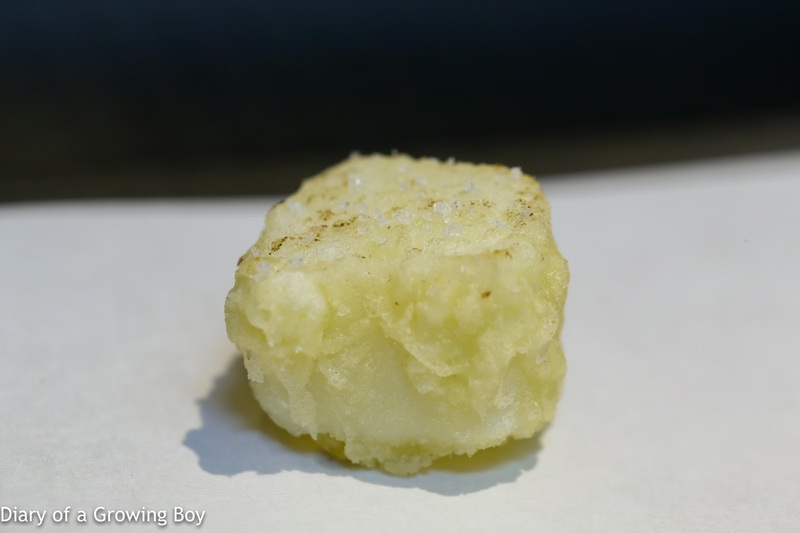 Mugwort gluten (蓬の麩) - nice and chewy as expected, with a dab of acidic sauce on top. 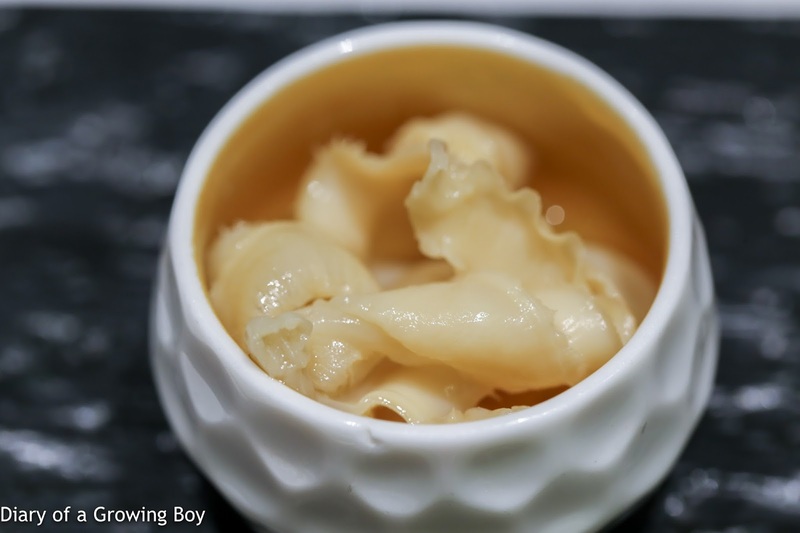 Scallop mantle (帆立貝ひも) - marinated and slightly acidic. 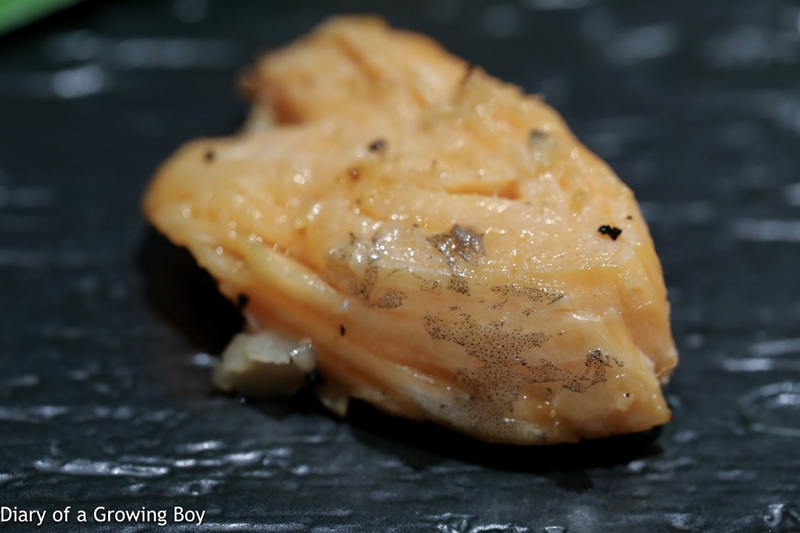 Cheek of ray marinated nanban-style (エイの頬肉南蛮漬け) - how interesting! 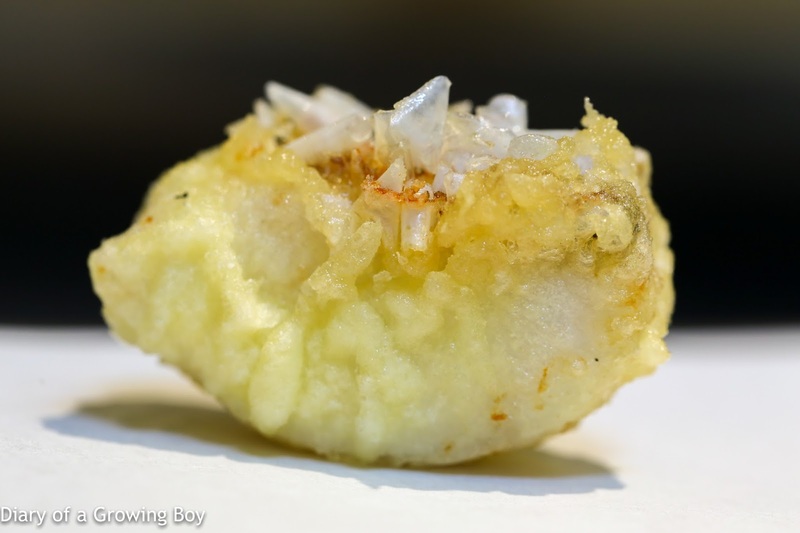 This really was a piece of the cheek from a (sting) ray, breaded, deep-fried, and marinated in vinegar. 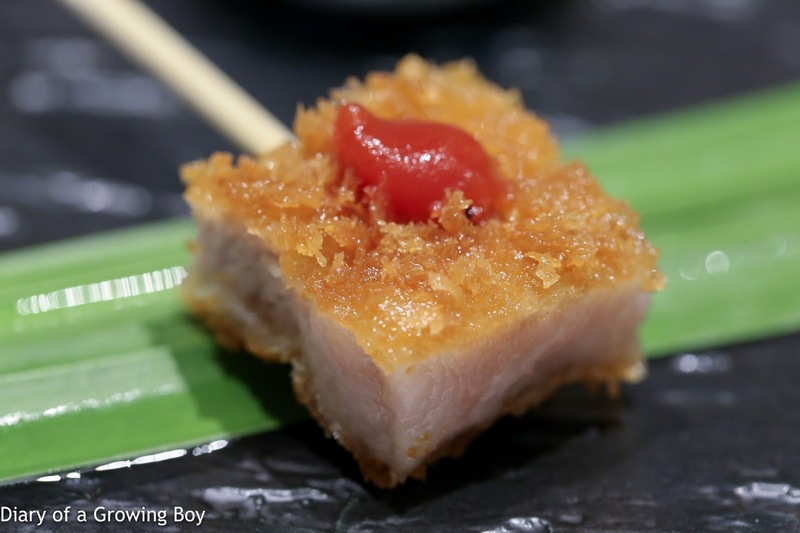 Deep-fried breaded pork (ポークの串カツ) - pretty tasty, with a little dab of ketchup. 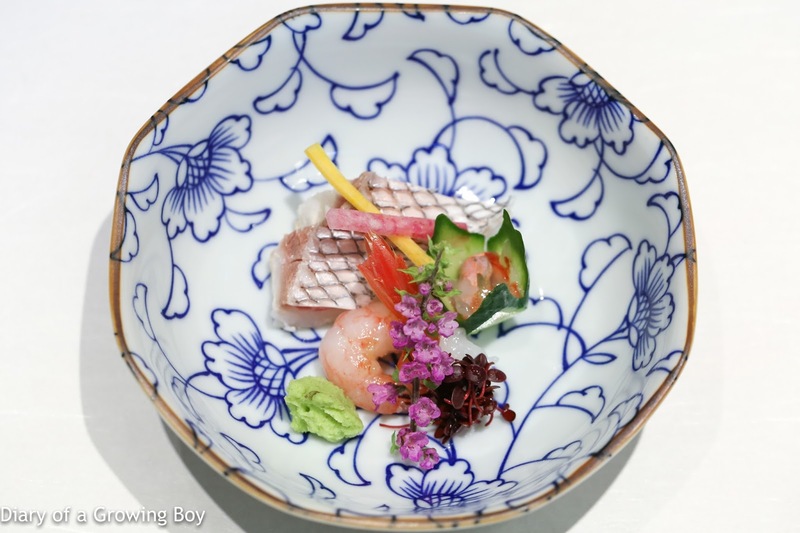 Next up was the chef's omakase otsukuri (お造り), which was red seabream (真鯛) and sweet shrimp (甘海老) - along with some of the shrimp tomalley in the cucumber "bowl". Miso stewed pork in tofu skin (豚肉湯葉巻きの味噌シチュー) - oh man... the pork was very, very tender... almost melt-in-the-mouth. The miso-flavored sauce for the stew was pretty damn yummy... and the little dab of mustard on top added that extra bit of kick. The deep-fried eggplant was pretty tasty, too. 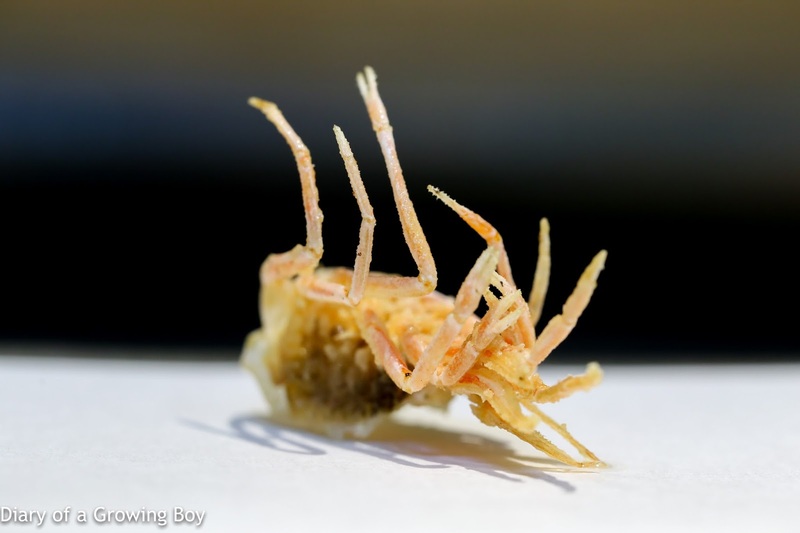 Prawn legs (海老の足) - really crunchy. I love these. 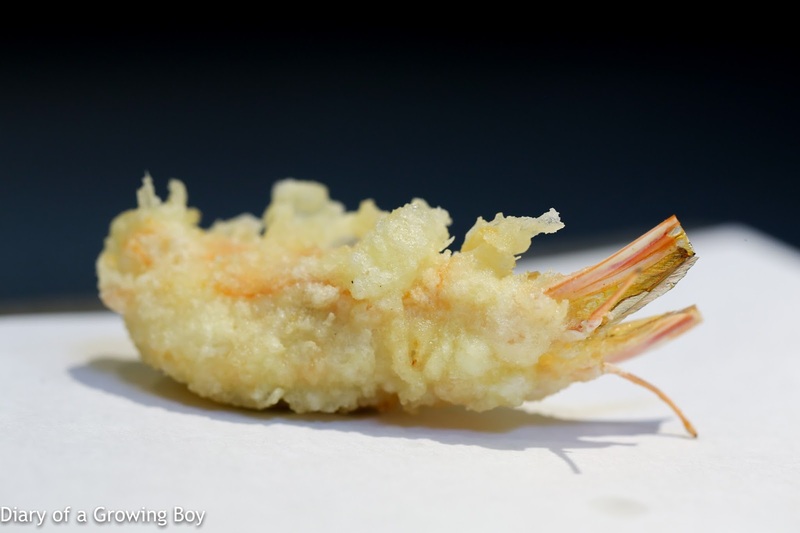 Prawn head (海老の頭) - yes, I love prawn heads, too! 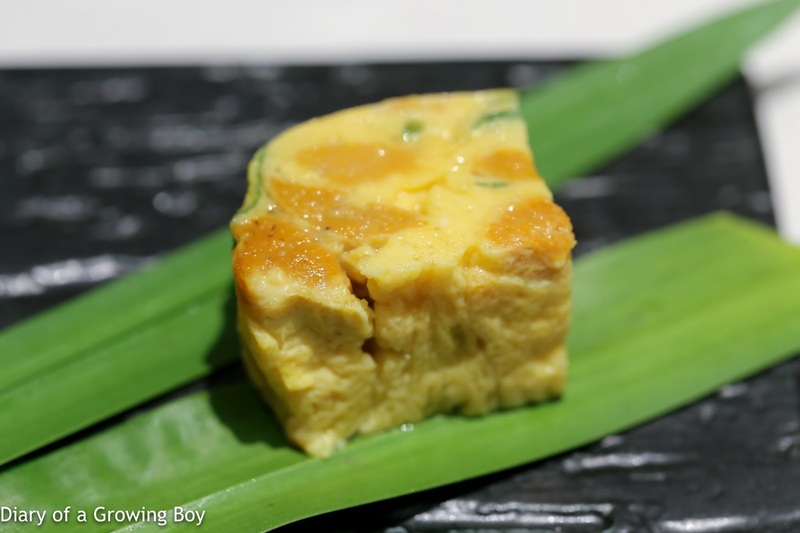 Tofu skin roll with crab (蟹の湯葉巻き蟹味噌のせ) - beautiful. 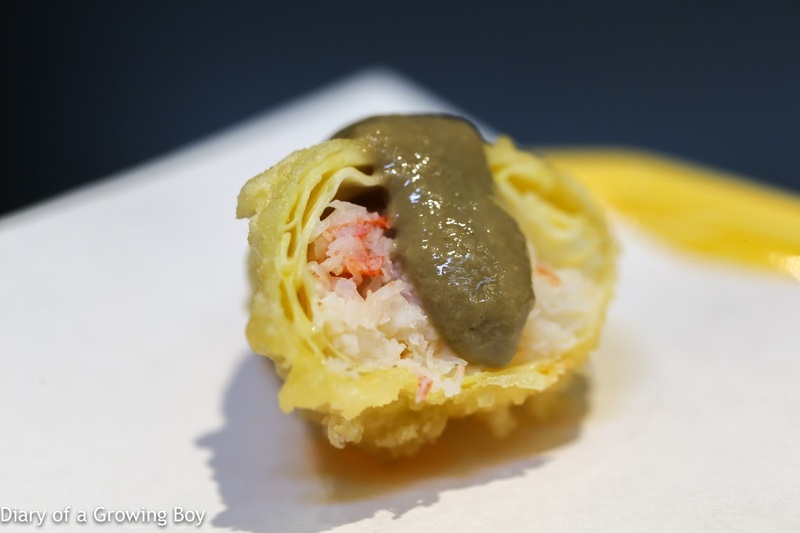 Crispy exterior with sweet crab meat stuffed inside, then topped with the intensely flavored marinated crab tomalley (蟹味噌). Tile fish (甘鯛) - just as delicious as the last time, or perhaps even better. Just loooove the flavors and textures of this fish... especially those scales! 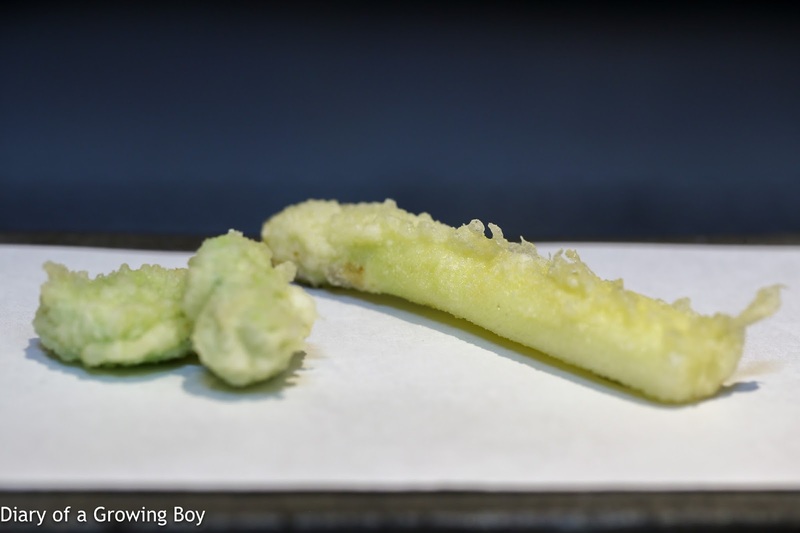 White asparagus and broad beans (白アスパラガスと天豆) - both were delicious, but the white asparagus was especially so. 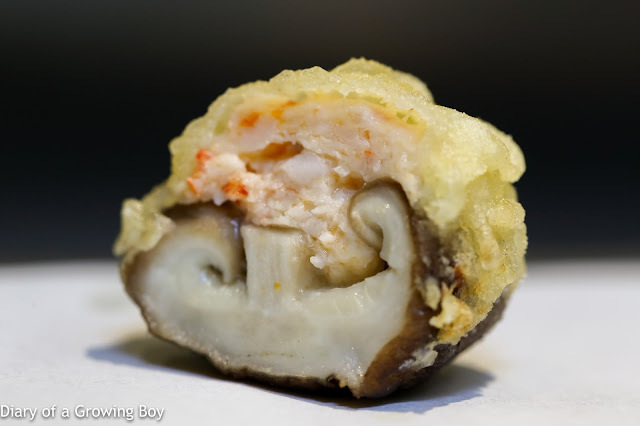 Prawn dumpling with shiitake mushroom (椎茸海老真薯) - a thing of beauty. 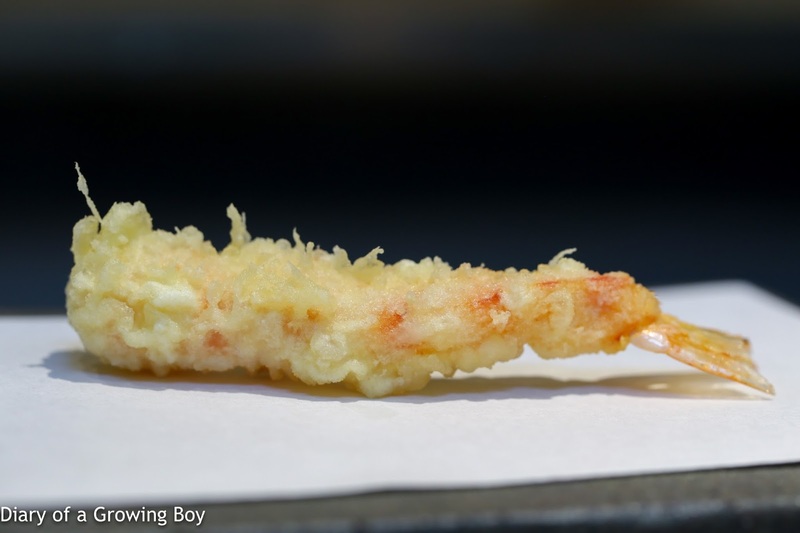 The perfect marriage between prawn paste and mushroom, with the perfect thickness and texture of the batter. 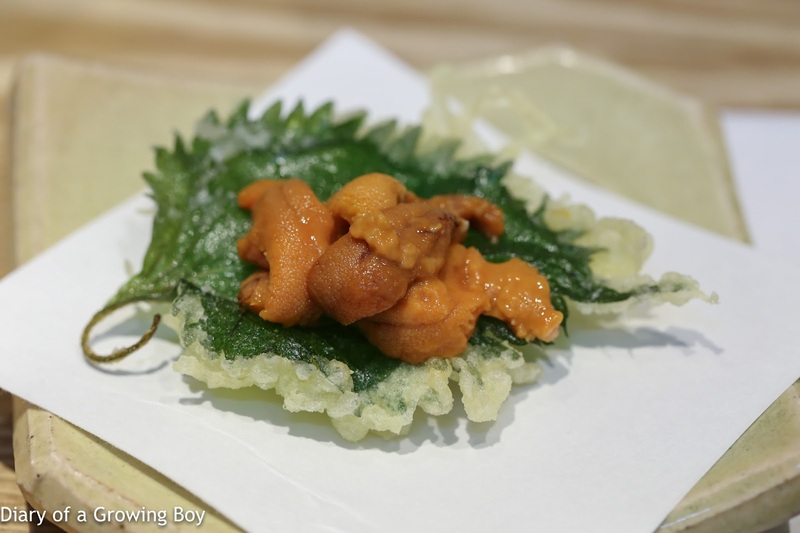 Sea urchin on green perilla "ohba-uni" (大葉海胆) - sweet and creamy sea urchin on top of deep-fried perilla leaf. So delicious and satisfying. Clam (蛤) - just look at how beautiful this clam was! 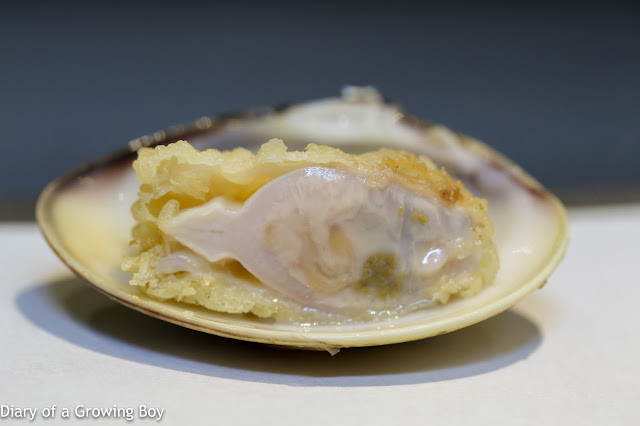 All the natural flavors of the clam was preserved in the deep-frying process. Yum! 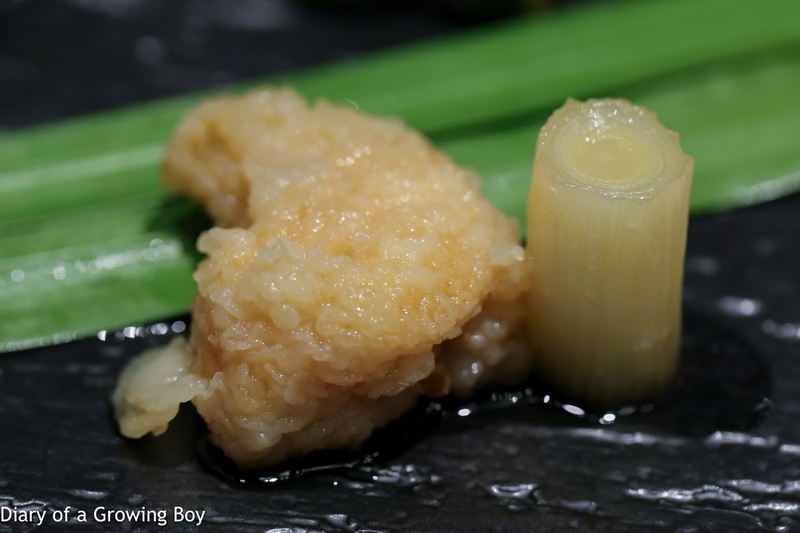 Cuttlefish (烏賊) - this was amazing. It's been a while since I last had a nice and thick piece of cuttlefish tempura, and today this was sprinkled with just a little bit of truffle salt on top. The scent of white truffle was certainly there, but fairly subtle. 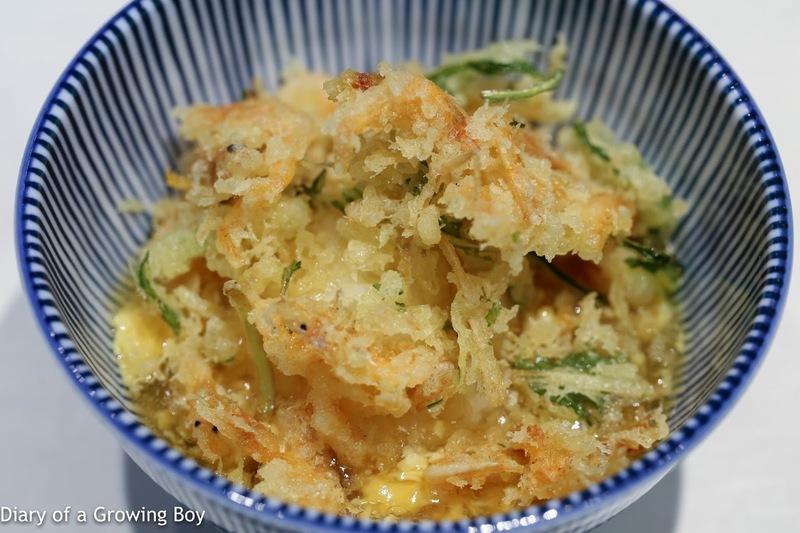 "Tendon" with sakuraebi from Suruga Bay (駿河湾桜海老のかき揚げ天丼) - I loved the tendon (天丼) on my last visit, and it was just as good today. 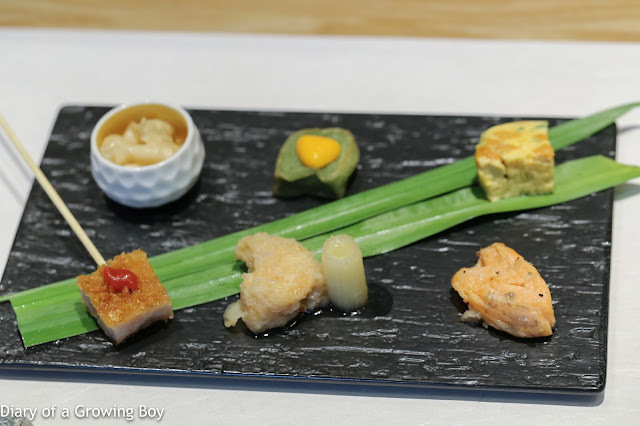 In addition to the layer of scrambled eggs between the rice and the deep-fried cake on top, Nagasawa-san added a new starchy sauce (餡掛け) into the mix. Very, very good. 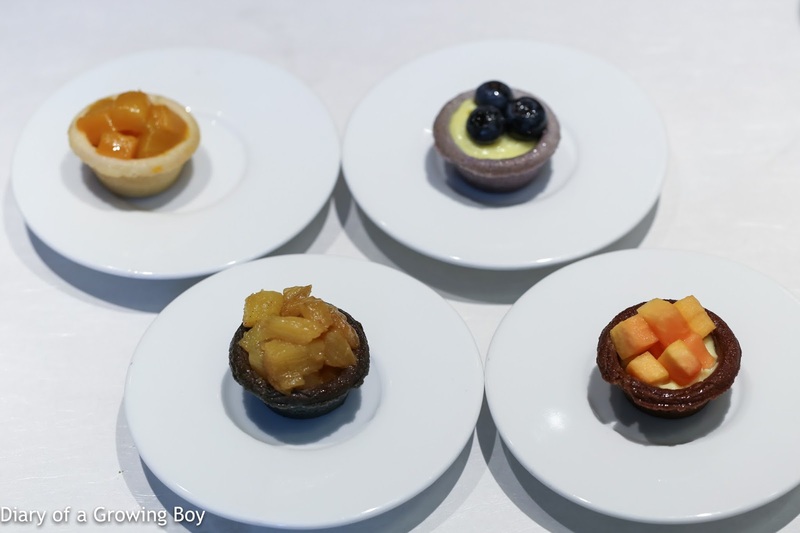 To finish, we were presented with one of these tiny fruit tarts - mango, blueberry, pineapple, and papaya. 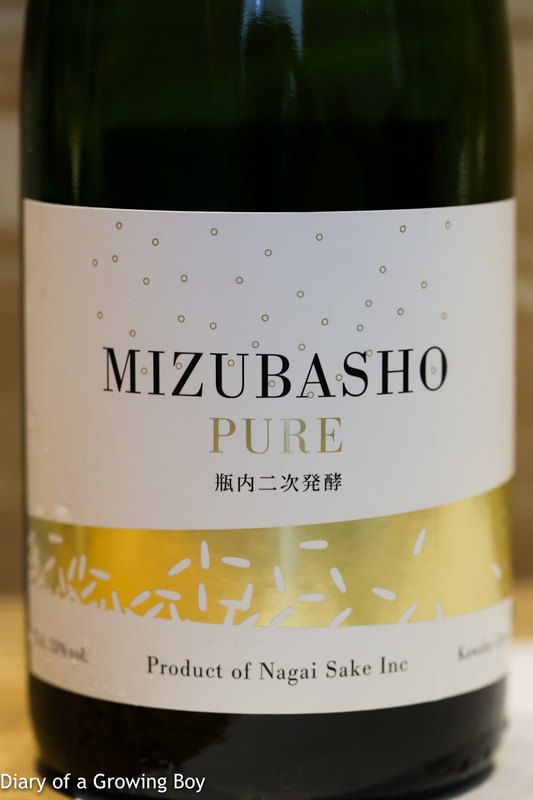 Mizubasho Pure - nice and sweet nose, with a little starchy rice and some banana notes. 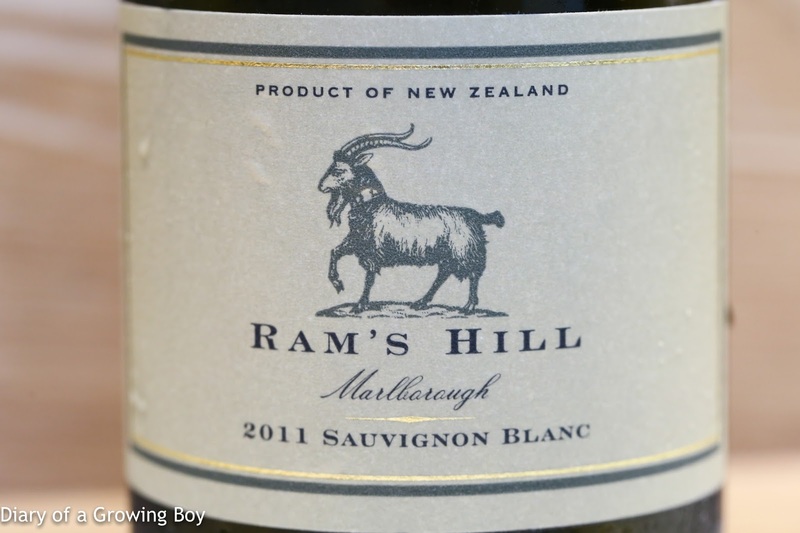 2011 Ram's Hill Sauvignon Blanc - mature and oxidized, with honey and something akin to Morinaga milk caramel... and also maybe apricot? 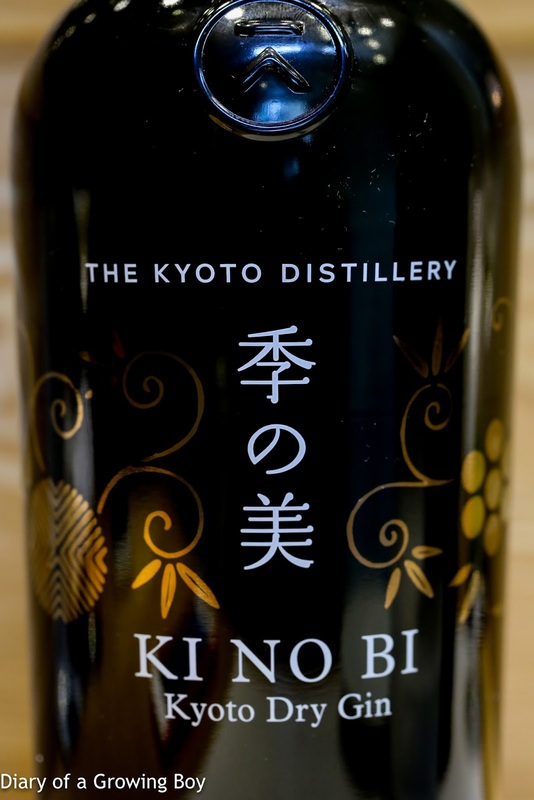 Ki No Bi (紀の美) - had this gin from Kyoto on the rocks. 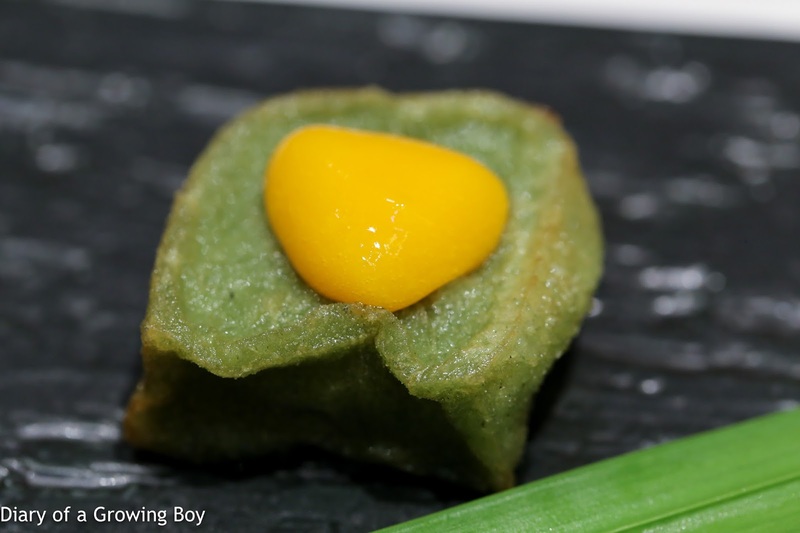 Definitely prominent nose of yuzu and sansho in addition to the juniper berries.